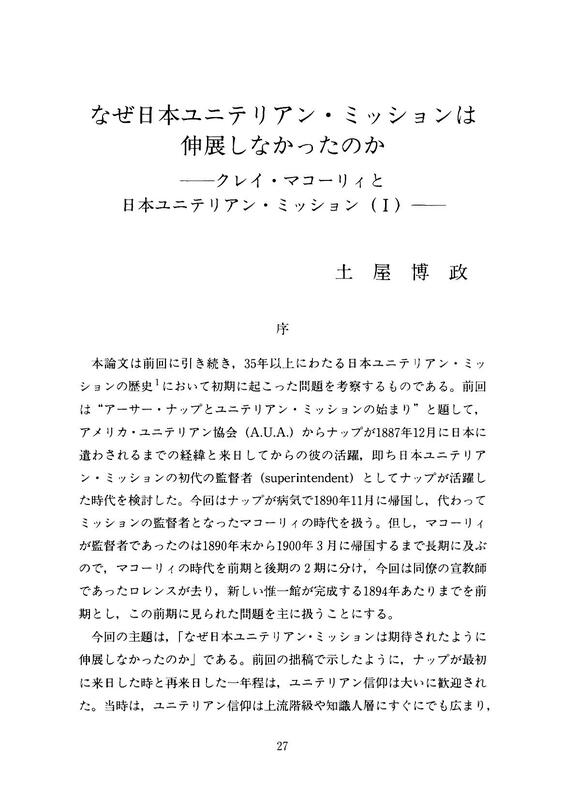 This paper deals with the first half of Clay MacCauley's superinten-dence of the Unitarian Mission to Japan (1890-1900), the second period in its overall history (1887-1923). Our theme is : "Why could not the Unitarians increase their members in Japan?" As my last paper showed, Arthur May Knapp and other Unitarian missionaries were all welcomed by leading Meiji figures. Fukuzawa Yukichi, Kaneko Kentaro and other eminent people offered them every convenience to spread their liberal movement. Their future looked full of promise. Knapp and MacCauley were convinced that their religion would prevail among intellectuals and the upper classes in the very near future. Knapp considered himself `a man with an Empire on his hands'. After Knapp left Japan for health reasons toward the end of 1890, however, the Mission began to grow less rapidly than had been expect-ed. Why? There were several reasons, both external and internal. From the second decade of the Meiji era (1877-), Japanese increas-ingly came to accept the principle that the Emperor occupied a special position in the nation. An important turning point in attitudes to the West came with the failure of attempts at revision of the unequal treaties in 1888. In the Meiji Constitution of 1889 the Emperor granted his people limited political rights, but the Imperial Rescript on Educa-tion of 1890 emphasized the duty of loyalty to the throne. There was a reaction against Christianity and things western. As a result, the Japanese people stopped imitating the West and searched for a culture which was distinctly Japanese. At the outset Unitarianism fitted in well with the atmosphere of "nationalism", because the Unitarians respected Japanese culture and religions. In fact, Knapp was surprisingly successful in his first few years. According to Fenollosa, `The marvel of his success is stated when I say that in less than two years he alone has accomplished far more with the upper classes than a large corps of evangelical mission-aries have been able to do in thirty.' Nonetheless, the reaction against Western ideas went further than Knapp and MacCauley had anticipated. As events moved toward the Sino-Japanese War (1894-95), Kaneko and other leading intellectuals began to disassociate themselves from the Unitarians. To ordinary Japanese the Unitarian movement belonged to Christianity after all, however liberal it might look. There were two major internal factors which prevented the Unitar-ians from flourishing : problems connected with MacCauley's personal-ity and leadership, and problems connected with the organization of the Mission itself. It was reported that "Knapp was able to secure the cooperation of influential Japanese, but MacCauley was not." Mac-Cauley was not so much a leader as a lone thinker, who was poor at communicating his ideas clearly to his co-workers. Soon after Knappwent home, MacCauley's clumsy handling of Kato Satori, the first Japanese Unitarian minister, led to the latter's withdrawal. In Knapp's view, "MacCauley was lacking in the diplomatic ability" to cope with Kato's problem. He also mentioned MacCauley's "almost morbid sensi-tiveness in regard to the dignity and responsibility of his position." Some influential members left the Mission after this incident. When contemplating the problems the Mission had as an organiza-tion, we must consider three aspects : finance, policy, and the liberal nature of Unitarianism itself. As far as the finance was concerned, the problem was straightforward. Since the American Unitarian Associa-tion was very small, it did not have sufficient funds to support the Japan Unitarian Association. If mission funds had been more abundant, the Mission might have been able to spread its net wider and win more supporters. The Unitarian missionaries had their own policies regarding mission work. First, they relied heavily on mission literature. It is true that their magazine and tracts were "very active, effective missionaries", but MacCauley's dependence on literature alone was not effective in keep-ing members within the circle. MacCauley underestimated the emo-tional dimensions of religious faith. It is well known that not only rituals, but also ornamental images and music are very helpful to keep faith alive. This was as true of religion in Japan as elsewhere. The Unitarians tended to be too intellectual, even for the intellectuals who were their targets. Unitarian models were absolutely necessary. Because of his sociable nature, Knapp was a living example to the Japanese of what Unitarian faith entailed. We find the following statement in The Japan Weekly Mail : "Mr. Knapp is himself a type of the faith he professes. Tolerant,liberal, genial, and highly cultured, he is precisely the sort of man to appeal to the refined and critical tendencies of the educated Japanese." MacCauley, however, failed to be a good model of Unitarianism since he preferred not to associate with the upper classes and intellectual leaders. Without Knapp, therefore, the Unitarian Mission lost much of its appeal. Secondly, Unitarian policy concerning the incorporation of other religions, especially Buddhism, turned out to be ambiguous. According to MacCauley, there were two kinds of opinion among American Unitarians ; "those which have been formed through the relations of Unitarians to historic Christianity and those which have resulted from free philosophic and scientific speculation upon many of the problems confronting human life." According to the first class of opinion, Unitar-ians were Christians. The second class of opinion saw Unitarians as philosophic theists, scientific moralists, and students who were sympa-thetic with all the forms of religion. Conservative Unitarians favored the former opinion and many radical Unitarians the latter, but Mac-Cauley was a middle-of-the roader. He professed himself a Christian, yet he was also willing to admit that Japanese Unitarians did not necessarily have to be Christians. His position caused confusion both within the Mission and outside. Liberal Christians such as Universalists and members of the Fukyu Fukuin Kyokai (General Evangelical Church) had no hostility to Buddhism, but hesitated to cooperate with the Unitarians because they were unwilling to compromise their Chris-tian identity. On the other hand, only a few Buddhists joined the Mission because there were some important Buddhist teachings which were incompat-ible with Unitarian beliefs. For example, Buddhists usually have nofaith in God the Father or in the immortality of the soul. The Jodo and the Jodo-Shin schools were exceptions, because of the stress placed on faith in the vow of Amida. Members of these schools found it less difficult in accept Unitarian teachings. It is no wonder that such leaders as Saji Jitsunen and Nakanisi Usio belonged to the Jodo-Shin school. However, the Jodo and the Jodo-Shin schools were only minority Buddhist groups in Japan. The liberal nature of Unitarianism itself caused some difficulties in Japan. As a critic said, "Unitarianism flourishes as a parasite on other bodies when their vitality is low." When standing alone, it could hardly walk. The chief reason why Unitarianism as Christian liberalism did not take root in Japan lay in the fact that it did not require people to leave their previous faiths and actually become formal members. Christians dissatisfied with more orthodox forms of Christians were potential customers, but there were very few such people in Japan. Unitarianism might therefore have broadened the minds of some Christians, but it rarely led complete unbelievers to liberal Christianity. The liberalism of Unitarianism also made it difficult for the Mission to develop a distinct identity. In the U.S. the radicals of the A.U.A. established their own group, the Free Religious Association. They rejected the word "Christian" from their statement of principles as too narrowing ; broadening out still more, they even expunged the word "theistic" and were ready to include agnosticism. In 1896 the Japan Unitarian Association came to resemble this radical offshoot, conse-quently the A.U.A. halved their financial aid. Previously, in 1893 the Association's Jiyu Shin Gakko (School for Liberal Theology) was only able to attract new students by waiving entrance and tuition fees, since so few students were willing to study Unitarianism.As is generally known, Fukuzawa, Kaneko, and other leaders suppor-ted the Mission in various ways. But none of them joined it. Three professors at Keio University, Garrett Droppers (Dutch Reformed) , W. J. Liscomb (Baptist) and J. H. Wigmore (Episcopal), had come to Japan to help the Mission. Although they were in full agreement withUnitarianism, none of them actually became Unitarians, or attendedUnitarian services on Sunday. Why did they do so? The reason wassimple : because they did not have to. MacCauley had claimed thatUnitarianism should not be a sect but a movement. Its mission to Japanwas just to spread a liberal faith. Membership figures were not thecentral concern.